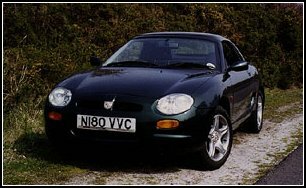 When Rover announced the MGF at the Geneva motor show in March 1995 I began dreaming of my youth. I called my local dealer, only to discover that just six prototypes had been made. Undaunted, I asked if I might see one, and to my great pleasure I was invited to Studleigh Hall to do just that. Our MGF 1.8 VVC (Variable Valve Control) was ordered the same day! It was delivered on 8th March 1996 - one of the first three VVCs off the line. Driving was a joy again. No matter what my mood, ten minutes driving the F put a smile on my face. It is a spectacular motor car and a real credit to Rover because it provides incredible road holding and performance at an affordable price. Let's hope Rover keep developing the marque. Fellow enthusiasts who haven't already tried it should visit the MG Home Page. Larry Perkins and I have been good friends since we worked together in the seventies. Although we live 5,000 miles apart we have always kept in touch and shared our mutual enthusiasm for fast cars. 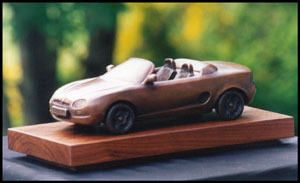 At Christmas 1996 Larry sent me some pictures of his latest bronze, a magnificent representation of the Lotus Elise. 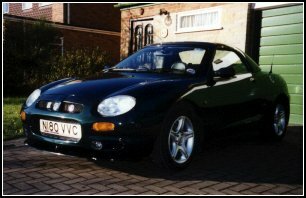 As I was a committed VVC owner, the first seeds of our MGF project needed little help to take root. After the initial excitement, the scale of the project took me by surprise. Larry lived in the USA where the delights of the new MG were alas unattainable, so he had yet to see a real car. Sculptures require accurate measurements, but Rover were unwilling to part with their drawings. The crafting of a bronze does not end with the clay model. Rubber moulds, wax casting and chasing, ceramic moulds, bronze casting, welding, chasing, patination and mounting each demand time, knowledge, skill and experience. In just five months it all came together. A retired draughtsman from Rover produced some amazing scale drawings. Perseverance finally paid off when we obtained Rover's permission to use their copyrighted design for a limited edition. The technical problems of casting an open top sports car were solved with the help of a specialist artworks foundry in Seattle. The result was a stunning one fourteenth scale representation of the MGF. As a condition of our copyright licence, Rover required that one of the bronze models should be donated to the British Motor Industry Heritage Trust at Gaydon in Warwickshire. 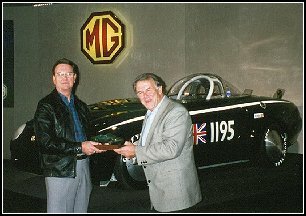 I presented one to Fred Coultas, Managing Director of the Trust, at the MGF's second birthday celebration on 27th September 1997. The MG in the background is the one that achieved a record speed of 207 mph earlier that year in the USA. If you visit the magnificent display of British cars at the Heritage Motor Centre you can see Larry's masterpiece on display in the entrance hall. 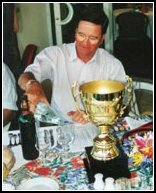 The inaugural Prix des Alpes took place from 19th-23rd July 1998. It provided an opportunity for participants to drive over some of the classic cols and Alpine sections of the French Alps which formed part of post-war Alpine Rallies. It was four days of pure magic: 1,600 Km of wonderful driving, magnificent scenery, great company and French cuisine. It began in Reims with a dash down the autoroute for lunch in Beaune, followed by an afternoon warm up through some delightful country roads to our overnight stop in Annecy. On day two we tackled the first of the classic Alpine cols - Forclaz, Bluffy, Collet, Aravis, Saisies, via Val d'Isere and the challenging 9,000 ft Galibier. The Dutch caravans proved quite a challenge, but after driving as close to my limit as I'd ever dared we arrived 'on the minute' at Briancon, reputedly the highest town in Europe. The third day was the toughest, and the mountains claimed their first casualties. 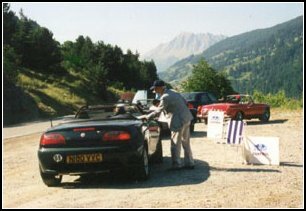 Many older cars overheated in temperatures of up to 40 degrees, and an MGF with a suspension problem was miraculously fixed with a Mini part by a small Rover dealership in the middle of nowhere. Paul Easter, former BMC works co-driver to the legendary Timo Makinen, was kind to us on the final day from Cannes to Aix-en-Provence, setting a challenging but straightforward run in to the finish. Coming second was a real surprise, but a great pleasure nevertheless. I thoroughly recommend the event to anyone who enjoys driving - and why else would you own a sportscar? The second Prix des Alpes took place from 11th-15th July 1999 in the French, Swiss and Italian Alps.  If you're interested in future events contact Peter and Sharon Browning of Sportscene International in Oxford, UK. Who knows, you might be one of the sixty lucky competitors to have fun next summer.